In an effort to address its ongoing app inferiority complex, Google just unveiled an extensive online training site. 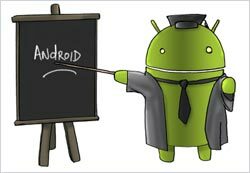 Android Training is a series of tutorials, best practices, code samples and general advice that the company hopes will help the development community produce better apps. Lessons cover everything from designing better navigation to implementing smoother multimedia streaming and optimizing battery life. In typical Google fashion, the effort is tagged “beta,” and Reto Meier, Android developer relations tech lead, blogs that the company plans to expand the offering considerably in coming months, including sample apps and course design for a broader range of general topics. It may not be coincidental that Google launches this trainer now. In recent weeks, research emerged suggesting that despite the Android operating system’s dominant market share, the majority of developers (51%) still plan to write for the Apple iOS platform in the coming year. Only 30% expect to write for Android. As challenging as fragmentation has been to the Android development community, so has the basic issue of revenue. Recently, Piper Jaffray analysts estimated that Apple’s iOS generates about 85% to 90% of the money spent on apps. Since the opening of the App Store, Apple developers have made about $3.4 billion, while Android developers have earned $240 million. According to the investment bank, iOS has been more successful in getting users to pay directly for an app. Only 1.3% of Android apps are fee-based, while 13.5% of the Apple App Store downloads are paid. On a sheer volume basis, 18.6 billion apps have been downloaded for iOS, compared to 6.7 billion for Android. At the new Android Training site, however, Google addresses the monetization question in a single lesson, “Advertising without Compromising User Experience.” The tutorial outlines the process for inserting ad banners in an app, using Google’s own ad network AdMob in the example. 2 comments about "Android Opens Online Training Site". David Gerbino from @dmgerbino consulting, December 22, 2011 at 11:04 a.m. The current Android app download growth rate is one billion app downloads per month. The latest Android statistics for Android daily activations: Android Hits 700,000 Daily Activations -- Apple, Google's next closest competitor, is activating a relatively paltry 189,000 iPhones each day. All the news in Android land is all positive. "Sales is certainly one way, but usage can be just as important. Google Android still dominates ad impressions, but it fell over 10% in November, dropping from 56% to 50%. Apple and RIM were the biggest benefactors of Android's fall. More and more well known and successful iOS are being ported to the Android environment and they look great. This new service by Google will aid greatly. I expect the Venture Capitalist money may begin to dry up for iOS only ventures. It is just no longer a good business decision to create a product exclusively for less than half of the smartphone market. David Gerbino from @dmgerbino consulting, December 22, 2011 at 4:05 p.m.
Apple: The company announced that the iOS App Store has passed 18 billion downloads. Additionally, users are downloading these mobile apps at a rate of over one billion per month. Android users are not locked into just 1 app store. They can get apps at GetJar, which claims 2 billion app downloads (not sure if that is just Android or for all their downloads). Amazon, Barnes & Noble and Verizon wireless also have Android app download stores. My guess is iOS and Android app downloads are within a few billion of each other now and through out 2012 Android app downs will become the dominate platform based on total app downloads. It will be fun to watch.